As February came to a close and March began, some of the smartest people in retail converged on Palm Springs, California like it was some sort of e-commerce Coachella festival. As they do every year around this time, these leaders in retail got together to share a combination of insights and recommendations as to the current state of digital commerce, while thousands more of their peers listened in to hear the latest in what’s happening in this world. Still, as anyone who’s been in “e-commerce” knows, eTail is about more than just selling things online. It has to be. As e-commerce has evolved over the past two decades its grown from an outlier and change agent to become a key component of how we shop and interact with brands. It’s past mobile commerce, multichannel and even omnichannel. Instead, now with its big brother, Brick and Mortar, it’s become just part of how we consumers buy stuff. But is it even more than that? 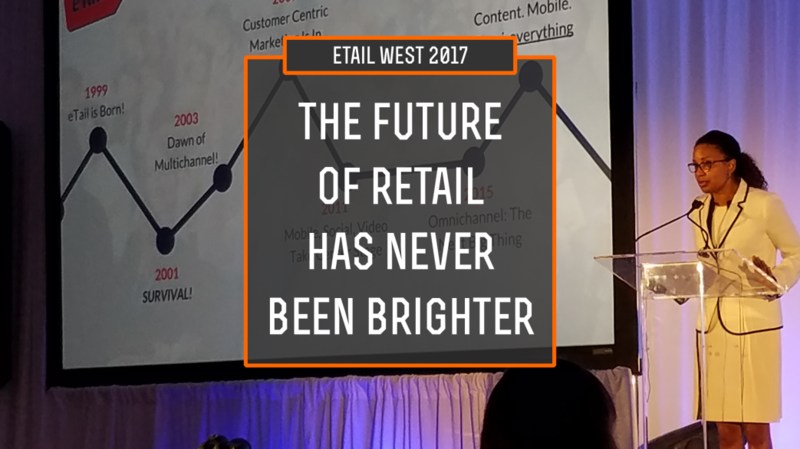 If this year’s eTail West conference was any indication, the answer is an absolute YES. And this is why I was so excited after being out there for the conference this year. It’s been a bit slow going to get here, but for the first time I really feel that retailers are starting to get it. They’re understanding that it’s more than channel attribution and pay-per-click advertising and content marketing. It’s all part of one bigger thing – and that is how our interaction with retailers ties into our lives as consumers. Customers don’t look at retailers as stores or brands or products. They are now looking to us as means to an end that are just ingrained in our daily lives. In an age where we seamlessly switch between real-life conversation, Facebook feeds, SnapChat, news consumption and shopping, these things don’t exist separately like they once did. No, today’s consumer looks at buying things as just another part of their daily life. Not a separate destination or project on a to-do-list, but instead as part of how we interact with the world. For years now I’ve been pushing the concept of a “holistic customer experience” – and by that I mean one that just exists as one voice and brand, across all channels (but communicating in ways native to those channels) and as part of a means to an end in customer happiness. It’s about always being there, but never being in the way. It’s about understanding that e-Mail and Facebook and Twitter and Instagram and face-to-face conversations are all just different ways we communicate, and that different people prefer to communicate in different ways. That’s what I was hearing this year at eTail. Finally. Not maybe from everyone, but from most people. Especially when you really listened to what it was they were trying to say. Greg Zacowicz of Bronto killed it on stage when he talked about real understanding of customer loyalty and lifecycles. And when Chau Banks started talking about New York & Company’s initiatives on cross-channel? I was like YES! IBM’s Jodi Wearn even got me so pumped with their views on the evolution of customer expectations and how AI is going to make retail smarter and more relevant than ever, I had to track her down afterwards to tell her just how spot on she is (sorry if I mobbed you, Jodi!). Long story short? All those people who are saying retail is dying are absolutely dead wrong. It’s definitely changing – but it’s not dying. Yes, malls may go the way of the dodo and big box retailers are going to have to keep fighting to stay ahead of Amazon … but dying? Far from it. As far as I’m concerned, there’s never been a more exciting time to be in retail – and the innovations happening behind the scenes right now are proof. Just wait until you start seeing them in the real world.